As Poole sat on the sidelines, his longtime sponsor has a new home. In January 2018, Chip Ganassi Racing announced that DC Solar would serve as the primary sponsor from both Kyle Larson and Jamie McMurray in select races. Poole filed the lawsuit in North Carolina Superior Court. He claims that he brought the DC Solar sponsor to the team in 2015. According to the filing, $2.5 million was brought to CGR for the 17-race sponsorship via the NXS division in 2015. $5.2 million was brought for 2016. DC Solar paid $5.5 million for the full-time sponsorship of the car in the 2017 NASCAR Xfinity Series season. In total, $13.3 million was paid for the Xfinity Series sponsorship. Brennan Poole was the CGR driver in all 3 seasons. In the lawsuit, Poole claims that his contract with Chip Ganassi Racing prohibits DC Solar remaining with the team without his consent. Poole is seeking damages. He’s not looking to have the sponsor removed from the car of Kyle Larson. The lawsuit also brings driver payouts to light. Most of that in under wrap, until a situation like a lawsuit surfaces. While running full-time in the Xfinity Series, Poole had a base salary of $225,000. In addition, Poole would receive a percentage of the championship and race payouts based on the finishing performance. He would earn 50% of a first-place purse, 40% of a top-10 finish and 30% for a top 20 run. Poole earned 4 top-5’s in both 2016 and 2017, 8 total. He has also collected 36 top-10 runs. In 2015, Poole brought in race earnings of $522,595 for the team while running just 17 races. NASCAR stopped releasing driver earnings following the 2015 season. Poole paid the Cornelius, North Carolina based consulting group, Spire $67,416 in fees between 2014-2017. However, he also claims he was misled by the company. Poole considered a ride with JR Motorsports in the NASCAR Xfinity Series. Spire informed Poole that the cost for car rental was $7.5 million. Poole later discovered that the actual cost was $3.2 million. Poole also claims Spire made similar claims in a separate contract discussions that didn’t come to fruition. DC Solar expressed interest in a primary sponsor role with Richard Childress Racing via the NASCAR Cup Series. Spire reported back that the price was $15 million. The actual price was only $10 million. DC Solar offered $8 million but the offer was declined. Target’s primary sponsorship of Kyle Larson expired in the 2017 season. The #42 went on a search for a new backer. CGR hired Spire to help locate a new primary sponsor, the same company that was working for Poole. The lawsuit claims that was a conflict of interest. “Spire unfairly, illegally and fraudulently procured the diversion and misappropriation of Brennan Poole’s primary sponsor, DC Solar, from Brennan Poole to CGR, also a client of Spire,” the paperwork filing states according to ESPN. Poole has a career best finish of 2nd place. That run came with just 7 races remaining in his 2017 season. He finished runner-up to Tyler Reddick at Kentucky Speedway. Last month, Poole served as the relief driver for Natalie Decker in the ARCA Racing Series. Decker has surgery days ahead of the event. She started the race and Poole jumped in to complete the event. 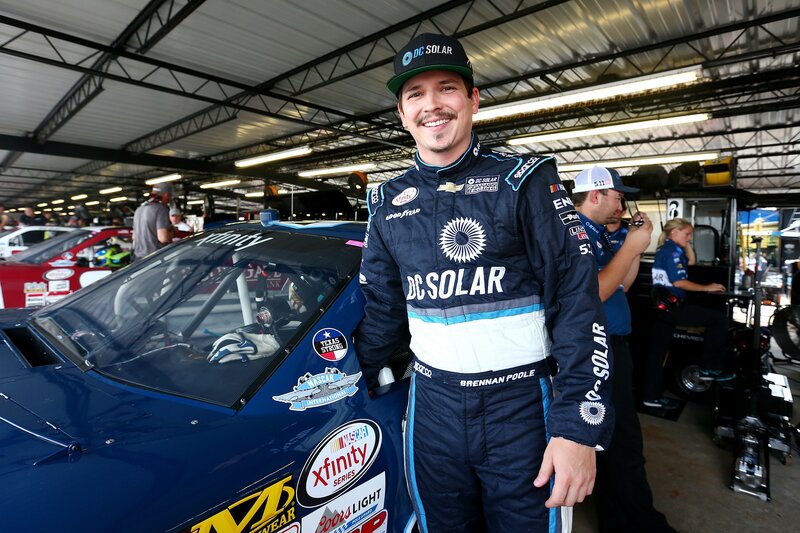 Beyond the Cup Series, DC Solar also remains as a primary sponsor for select races in the NACSAR Xfinity Series for Chip Ganassi Racing. Kyle Larson has been the driver of that machine as well.